Training for an Ironman triathlon, which is a 1.2 mile swim, 112 mile bike ride, and 26.2 mile marathon, is not an easy thing. For my first Ironman, I dedicated nine months and a total of about 24 weekly hours to training. 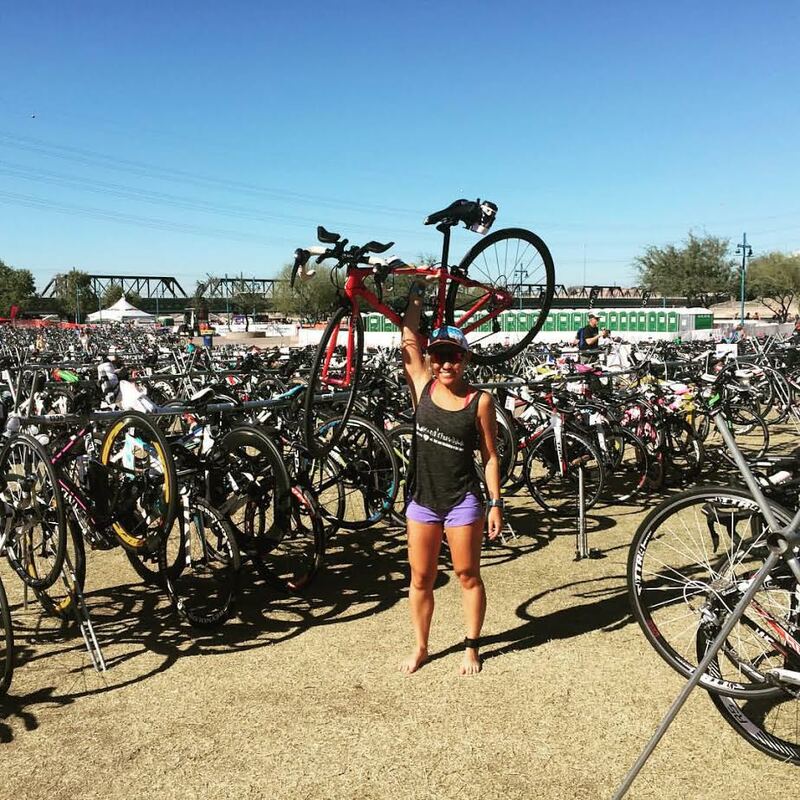 I had never ridden a road bike, swam competitively, or ran a full 26.2 mile marathon. During this time, I learned a lot about myself –– I gained independence and learned the true meaning of grit and determination. "During this time, I learned a lot about myself –– I gained independence and learned the true meaning of grit and determination." My friend handing me my medal at my first Ironman on July 26th, 2014 @ Vineman Triathlon now known as Ironman Santa Rosa. In 2013, I was going through what I today call a rough patch in life. I’d just graduated college, had my first full time job, and was in a serious relationship, but I found that I wasn’t happy. When the relationship ended, I realized I had no idea who I was as a person. What was I doing with my life, and what type of person had I become? In my eyes, I’d become a woman who was dependent on others, and that wasn’t the type of woman I wanted to be. "In my eyes, I’d become a woman who was dependent on others, and that wasn’t the type of woman I wanted to be." While I was going through this rough patch, I met some friends through the Leukemia and Lymphoma Society’s Team in Training. I ran a couple half marathons with the group and fundraised, but didn’t dream of doing a triathlon let alone an Ironman with them until I was somewhat convinced by a friend that I could do it. At the time, I really had no idea what I was signing up for. Running half marathons was somewhat easy for me –– though I was definitely not a fast runner, I ran/walked all my half marathons and got through them with little training. 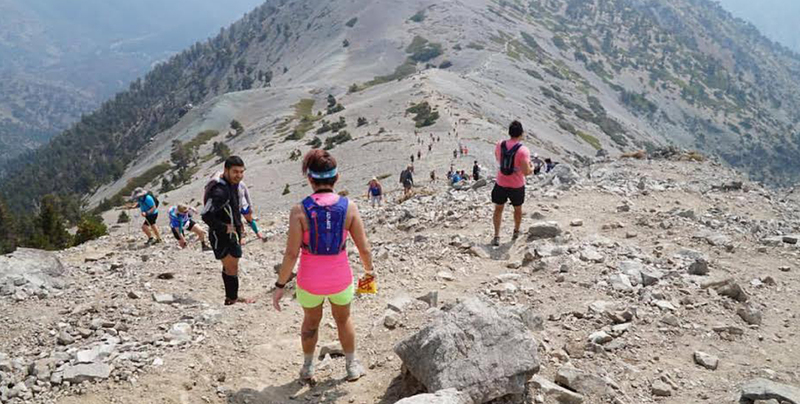 I thought an Ironman would be the same –– what a misconception that turned out to be. 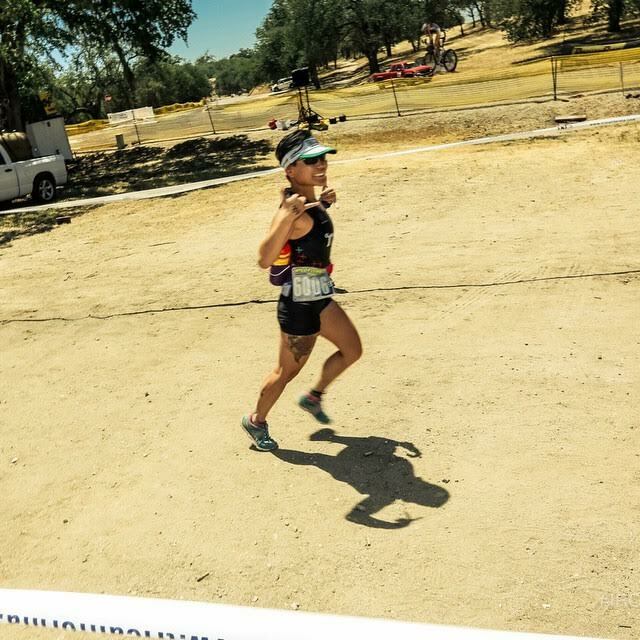 Running at Wildflower my second year of competing in 2015. From November to July I dedicated my life to training, and it was the hardest thing I ever did in my life. During this time I did things that scared me, like swim in the ocean and shave my head bald to raise $1,000 for cancer. When training first started I thought I could keep up my unhealthy lifestyle of barely sleeping, staying out all night, and working, but I would soon learn that it was actually hurting my training, and that I wouldn’t be finishing my Ironman if I didn’t start taking my training more seriously. My coaches feared that I wouldn’t make the cutoff times for an Ironman and finish within the 15 hour limit as my cycling skills were severely lacking. With that knowledge, I put training first and gave it my all. 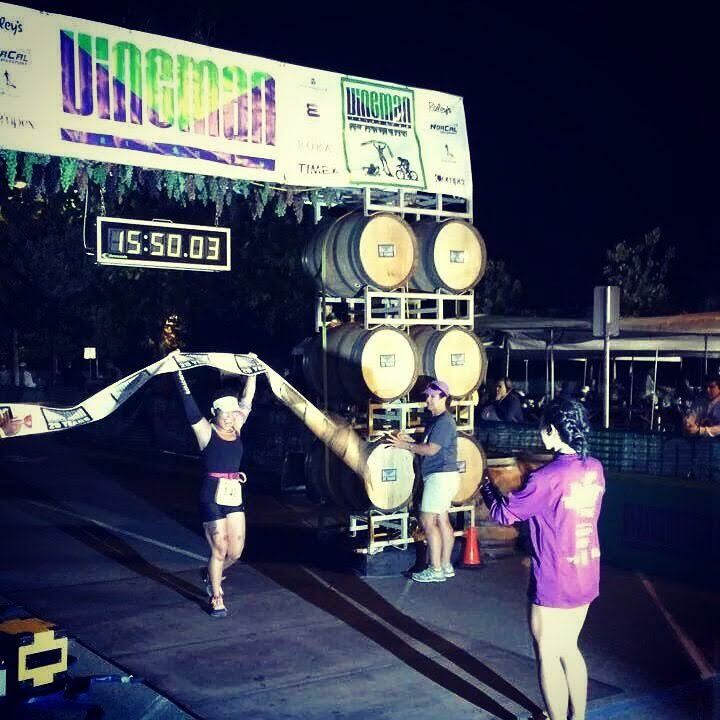 On July 26, 2014, I crossed the finish line of my Ironman before the 15 hour cut off time, and it was one of the happiest moments of my life. All the sacrifices I made the last nine months paid off, and I achieved something that I worked extremely hard for. I never really worked hard for anything in my life, and this changed everything. "All the sacrifices I made the last nine months paid off, and I achieved something that I worked extremely hard for." The day before completing my 2nd Ironman in 2015 @ Ironman Arizona. This whole event made me realize that if something wasn’t scaring me, it wasn’t going to change me. I learned to be comfortable with the uncomfortable, and that’s where the magic happens. "This whole event made me realize that if something wasn’t scaring me, it wasn’t going to change me. I learned to be comfortable with the uncomfortable, and that’s where the magic happens." 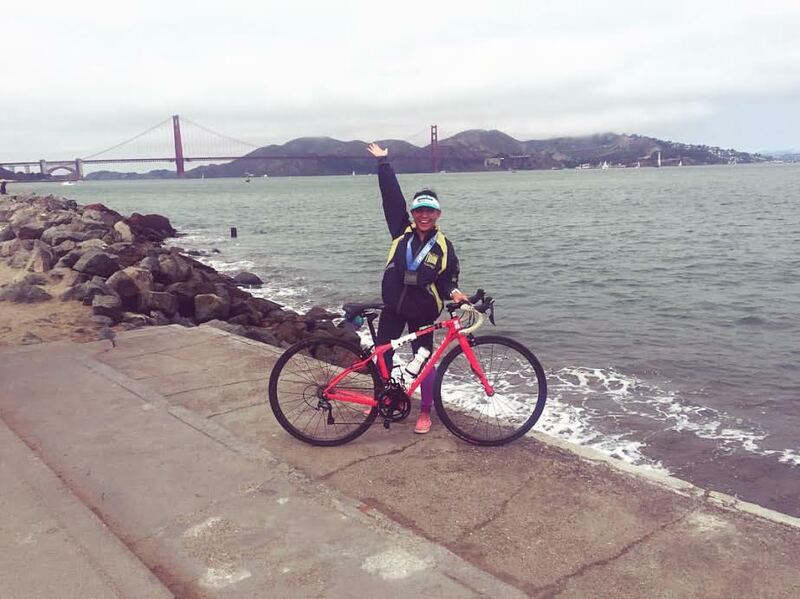 After jumping off a boat near Alcatraz Island and completing the Alcatraz Triathlon in 2016. I’ve completed a total of two full Ironmans and numerous half Ironmans since then, and something that surprises me is the lack of women participating, especially Asian American women. I think there are still a lot of women out there who think that they can’t do what I did, and that’s untrue. "...I found that it made me a stronger woman and more determined than ever to follow my dreams. It’s my hope that Asian American women and women in general read my story and be empowered to take charge like I did." 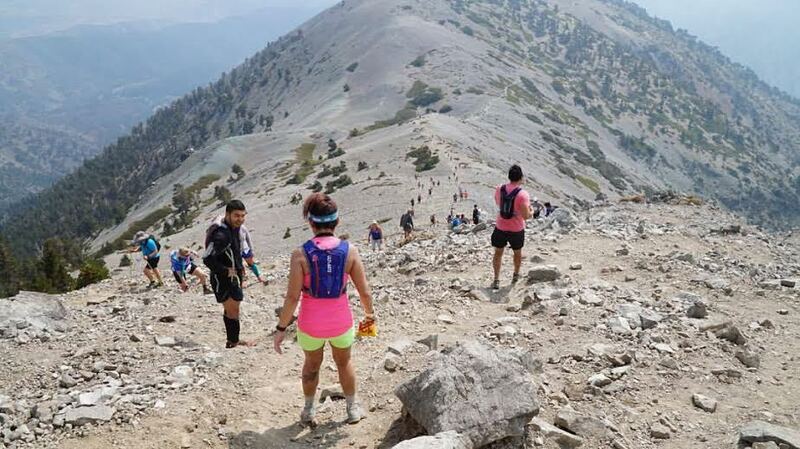 Near the top of Mt Baldy, where I completed "Run to the Top" in 2017. I know men and women of all ages, sizes, and fitness levels training hard and completing half marathons to full Ironmans, all while working full-time and managing a family. As the Ironman motto goes, “Anything is Possible.” Competing in any endurance event changes your life and through the challenges, I found that it made me a stronger woman and more determined than ever to follow my dreams. It’s my hope that Asian American women and women in general read my story and be empowered to take charge like I did. All it takes is a little grit and determination. Lisa Furumoto is currently a Staff Accountant at Upper Crust Enterprises and is working on pursuing a Masters in Accountancy. When she is not studying for her GMAT or working, you can find her running or cycling up mountains, swimming in the ocean or sharing a quality beer with friends.